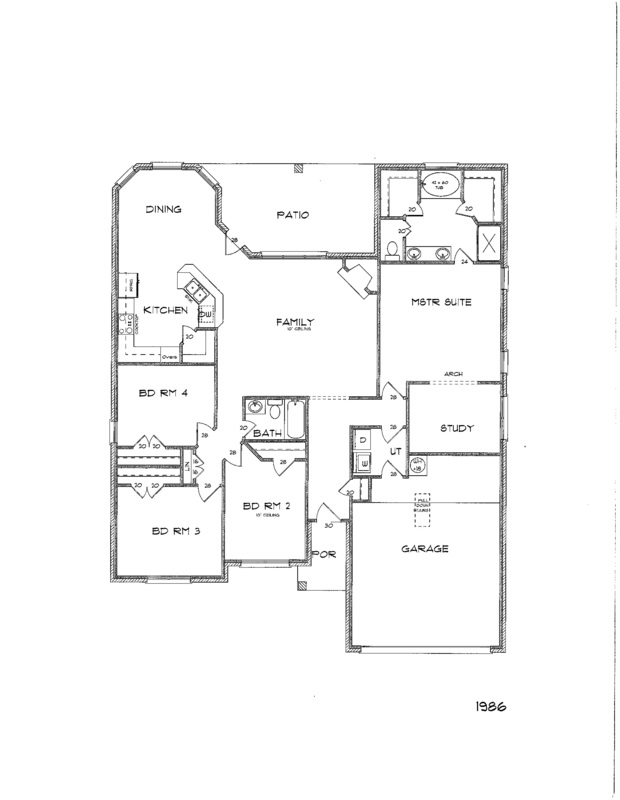 Another great floor plan, the Excalibur, shows off Carothers craftsmanship. The open living and dining area are full of upgrades from the pop-up ceiling with a variety of lighting and stone fireplace to it’s loaded kitchen with double ovens and walk-in pantry. Both baths have marble tubs, sinks and counters with a jetted tub and separate shower in the master. The master also has the pop-up ceiling with lighting and an elegant arched opening goes from the master to the study, nursery, exercise area or whatever you want to use it for – the only Carothers floor plan with this great feature! The outside completes the picture with covered patio, privacy fence and landscaping that includes front and back sod and sprinkler system. The Excalibur 1986 Plan from Carothers Homes offers a large living and dining area with a beautiful arched doorway between. The breakfast nook has lots of natural light and leads to the covered patio for relaxing after a long day. A corner stone electric fireplace in the family room adds elegance and warmth. The kitchen includes granite counter tops with tiled back splash, Slate steel appliances and large pantry. The master suite includes large jetted tub, separate shower, his and hers closets and dual vanities. To complete this home, a large covered patio, wood privacy fence, sprinkler system and sod are included. Come by and visit us and see for yourself the craftsmanship of Carothers Homes.